Staphylococcus aureus expresses several proteases, which are thought to contribute to the virulence of this bacterium. Here we focus on aureolysin, the major thermolysin-like metalloprotease. Despite the importance of aureolysin in the physiology and pathogenesis of S. aureus, relatively little information was so far available concerning the aur gene diversity and mobility within and between the major subdivisions of the S. aureus population. Therefore, an epidemiologically and genetically diverse collection of S. aureus strains was used to determine the range of aureolysin (aur) gene polymorphism. Sequence analyses support the conclusion that the aur gene occurs in two distinct types of related sequences. The aur gene was much more polymorphic but, at the same time, showed higher purifying selection than genes utilized for multilocus sequence typing (MLST). Gene trees constructed from aur and concatenated MLST genes revealed several putative assortative recombination events (i.e. entire aur gene exchanges) between divergent lineages of S. aureus. Evidence for intragenic recombination events (i.e. exchanges of internal aur segments) across aur genes was also found. The biochemical properties and substrate specificity of the two types of aureolysin purified to homogeneity were studied, revealing minor differences in their affinity to low molecular weight synthetic substrates. Although numerous nucleotide differences were identified between the aur alleles studied, our findings showed that a strong purifying selection is acting on the aur gene. Moreover, our study distinguishes between homologous exchanges of the entire aur gene (assortative recombination) between divergent S. aureus lineages and recombination events within aur genes. Proteases are important virulence factors for a variety of microbial pathogens and may contribute to tissue degradation and resistance to the host defense system. Staphylococcus aureus secretes a typical metalloprotease that is commonly referred to as aureolysin. This enzyme, which is a member of the thermolysin family of zinc-dependent metalloproteases, comprises a single chain of 301 amino acids that consists of a β-pleated N-terminal domain and an α-helical C-terminal domain . In vitro, aureolysin activates prothrombin showing pseudocoagulase activity  and inactivates mammalian plasma protease inhibitors by cleavage [3, 4]. Moreover, the enzyme has been suggested to contribute to the resistance of S. aureus to the innate immune system by degradation of the human antimicrobial peptide LL-37  and inhibitory activity against immunoglobulin production by lymphocytes . In addition, aureolysin is required for activation of a serine protease (SspA; also named V8 protease) secreted by the same microorganism [7–9]. Recently, Beaufort and colleagues  reported that aureolysin is capable of converting the zymogen pro-urokinase into its active form. Urokinase, in turn, is a component of the plasminogen activation system. Upon activation, plasmin displays enzymatic activity towards a number of substrates, including fibrin. Therefore, aureolysin may contribute to activation of the host's fibrinolytic system by S. aureus, and thus promote bacterial spread and invasion. Nevertheless, in a mouse model of septic arthritis, inactivation of aur gene did not affect the frequency or the severity of joint disease . In our previous study, we cloned the aureolysin gene and proposed the name aur . Sequence analysis revealed a coding sequence (CDS) of 1,527 nucleotides, starting with a GTG codon with the potential of encoding the aureolysin preproenzyme of 509 amino acids. The nascent translation product of the aur gene included an N-terminal signal peptide (prefragment) of 27 amino acids with a typical signal peptidase cleavage site, followed by a profragment and a mature protease composed of 181 and 301 residues, respectively. We showed the presence of the aur gene in all investigated community-acquired as well as laboratory strains . PCR-restriction fragment length polymorphism (PCR-RFLP) analysis of the aur gene revealed only two RFLP types . Sequencing of the aur gene from two representative strains of each of those two PCR-RFLP types confirmed that the gene occurred in two forms (type I and type II). Deduced amino acid sequences of aureolysin were almost identical within a type, whereas the sequence identity between the two types of genes was only 89%. The strong conservation of aur among two types of related sequences argues in favor of the possibility that aureolysin has important housekeeping functions. Introduction of the multilocus sequence typing (MLST) method , which measures sequence variation at seven slowly evolving housekeeping genes, has resulted in a detailed understanding of S. aureus population structure. The evolution of S. aureus may have been influenced by chromosomal replacements . Nevertheless, the MLST data have revealed a predominantly clonal evolution of this species and its subdivision into two fundamental groups (supergroups) consisting of multiple clonal complexes . Although MLST has been primarily developed as a typing approach, it has also been used successfully for examining the degree to which homologous recombination has occurred within the S. aureus genome [14, 16]. Our previous study, which focused on aureolysin , was conducted shortly before the MLST era. At the time, it was felt that the presence of only two types of aur genes could reflect the existence of two supergroups of S. aureus strains. However, a real degree of polymorphism of the aur gene could not be determined previously, since we used only local strains and therefore a very limited number of genotypes. In the current study, we have therefore focused attention on the genetic analysis of the aur gene to determine its diversity and the extent to which it was mobile within and between the major population subdivisions. For this purpose, we have used epidemiologically and genetically diverse strains of S. aureus. Additionally, we performed biochemical studies on aureolysins of type I and type II to determine their properties such as enzymatic specificity and activity. For aur sequencing, a group of 24 methicillin-resistant S. aureus (MRSA) and 42 methicillin-susceptible S. aureus (MSSA) epidemiologically unrelated strains was selected from different collections of S. aureus strains [22, 23]. Strain selection was based on preliminary MLST data and was intended to include strains with a large degree of diversity. Strains were derived from a variety of human infections as well as from nasal swabs of asymptomatic carriers. Their geographic origins included mainly European countries but also the first three vancomycin-resistant S. aureus (VRSA) strains, MI-VRSA (strain VRS1, HIP11714), PA-VRSA (strain VRS2, HIP11983) and NY-VRSA (strain VRS3, HIP13170), recovered in the United States were included in this study. Informed consent was obtained from all patients and participants which were involved in our study. All procedures were performed according to guidelines of the local ethics committees which are in compliance with the Helsinki Declaration. All strains were coded to protect patients and participants confidentiality. Additionally, thirteen S. aureus strains for which the genome sequences are available on the NCBI website (see Availability and requirements section for URL) were analyzed. For studying biochemical properties of the two types of aureolysin, strains V8-BC10 (type I) and the sarA and sspA double mutant of 8325-4 (type II) (obtained from Dr S.O. Arvidson, Karolinska Institute, Stockholm , and Dr S. Foster, University of Sheffield, Sheffield, UK, respectively ) were used. MLST was performed according to protocol developed by Enright et al. . Sequences of each locus were compared to the data in the S. aureus MLST database (see Availability and requirements section for URL), and resulting allelic profiles were assigned to particular sequence types (STs) for each strain. Sequences of unknown alleles and the allelic profiles of novel STs were submitted to the MLST database curator for allele or ST number assignment. BURST software (see Availability and requirements section for URL) was used to classify related STs into clonal complexes (CCs) of phylogenetic relationships. Such clusters were composed of two or more STs which differed at a single locus (single-locus variants) or two loci (double-locus variants) . A singleton was defined as a sequence type that is not grouped into a clonal complex. PCR products were used as the templates for sequencing reactions. These templates covering the whole aur gene were generated by use of recombinant Taq DNA polymerase (Fermentas, Vilnius, Lithuania) (Cycling conditions: denaturation, 94°C/30 s; annealing, 55°C/30 s; elongation, 72°C/30 s) with primer pairs aur-F1 (5'-GCTGTTTTTAARATTTCAGGAGG) and aur-R1 (5'-TGAAATTTCTGGTGTYACTGTAATTAA), aur-F2 (5'-GAAATCGATGGTGACAGTAATAA) and aur-R2 (5'-CTACGTCATTTGCACCYGATAA), and aur-F3 (5'-GACAAAATGATYTATGGTGATGG) and aur-R3 (5'-GTGTTTAACATTACTTCTTCTTGTTT). The same primers were used for the sequence reactions. Nucleotide sequences were aligned using ClustalW (see Availability and requirements section for URL) software. Nucleotide diversity was calculated using the DnaSP package, version 4.10 . The proportion of synonymous (silent; ds) and non-synonymous (amino acid-changing; dn) substitution rates was calculated using the software SNAP (see Availability and requirements section for URL). If purifying selection has occurred, a gene has a ds/dn ratio > 1. Absence of selection should generate ds = dn. A value < 1 indicates diversifying selection or accelerated evolution. Neighbor-joining (NJ) trees were constructed using the program Mega version 3.1 . Genetic distances were calculated by the Kimura two-parameter model. Bootstrap analysis (1000 repeats) was performed to evaluate the topology of the phylogenetic tree. Recombinant aur sequences were detected employing the RDP-V2 Beta 08 software  using six automated recombination detection methods including RDP , Geneconv , Bootscanning , Maximum Chi Square (MaxChi) , Chimaera , and Sister Scanning (SiScan) . Results were then checked by visual inspection. Amino acid sequences were edited in Genedoc software (version 2.6.02) . Specific activity of enzymes was determined by α-2-macroglobulin (α-2 M) (BioCentrum Ltd.) titration. Constant amounts of enzymes (0.02 nmol) were incubated with increasing amounts of α-2 M for 1 h, at room temperature. Then, high molecular weight protein substrate (Hide Power Azure, Calbiochem) was added and residual enzyme activity was measured as an increase of absorbance at 595 nm after 30 min incubation at 37°C. It was assumed that one molecule of α-2 M inhibits two molecules of aureolysin. For kinetic studies low molecular weight synthetic substrates, Fa-Gly-Ala-NH2, Fa-Gly-Val-NH2, Fa-Gly-Phe-NH2 and Fa-Gly-Leu-NH2, (Bachem, Switzerland), were used. The kinetic constants were determined from the initial rates of hydrolysis by the Lineweaver-Burk method, based on triplicate rate determinations at five substrate concentrations in the range of 0.1–5 mM. Galanin digestion was performed by incubation of the substrate with the enzymes in 2000:1 molar ratio for 5 min, 37°C, and nano-LC-MS/MS analysis of the obtained products were done at Faculty of Chemistry and Regional Laboratory, Jagiellonian University, as describe elsewhere . To compare degradation patterns of proteins by aureolysins, α-1-antitrypsin, α-1-antichymotrypsin (both from BioCentrum), collagen, beta casein (both from Sigma), HMWK and LMWK, were incubated with the same amounts of active aureolysins of type I and type II at the molar ratio from 5:1 to 200:1 for the time ranging from 5 min to 12 hours. Then, EDTA was added and reaction mixtures were subjected to high throughput electrophoresis . Nucleotide sequences for the aur gene can be found in the GenBank database under accession numbers EF070219 to EF070241. A total of 79 strains revealed 48 different sequence types (STs) on the basis of the MLST data (Table 1). 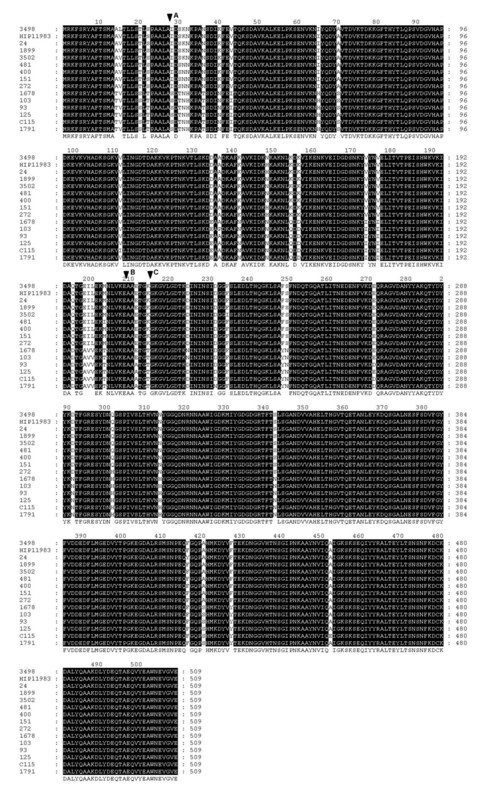 On the basis of BURST analysis, thirty six STs with 65 strains were grouped into nine CCs, while the remaining twelve STs that comprised 14 strains were singletons. Sequences of seven MLST housekeeping genes were concatenated to further examine the relationship between the sequence type and the aur allele. The resulting gene tree (Figure 1A) was consistent with the one reported previously and supports the division of S. aureus strains into two fundamental groups (supergroups I and II) which comprise multiple clonal complexes . 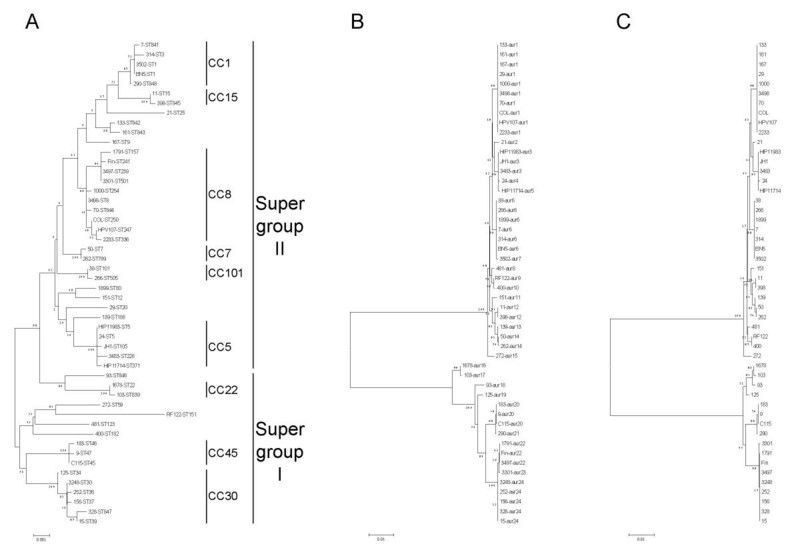 Supergroups reflect the evolutionary relationships among the strains of S. aureus and are concordant to subspecies groups distinguished by Robinson and colleagues  and two main groups developed by Cooper and Feil . Phylogenetic trees based on (A) MLST, (B) entire aur genes and (C) shortened aur sequences. Phylogenetic trees for 50 S. aureus strains were constructed by using the neighbor-joining method based on the Kimura two-parameter model with MEGA 3.1. All branch lengths are drawn to scale. Bootstrap values were calculated for 1,000 replicates and are given for each branch. Strains used represent all combinations of STs and aur alleles. Each strain is abbreviated with the isolate designation, followed by the MLST (ST) designation in panel A, and the aur allele designation in panel B. CCs and supergroups are indicated in panel A. Phylogenetic analysis based on housekeeping gene sequences placed strains in groups which corresponded to CCs (Table 1) identified by the BURST analysis with the exception of the ST188 strains which were sorted as unique (panel A). The Supergroup is based on a reconstruction of S. aureus phylogeny conducted in this study and those presented previously [17, 18]. Characteristics of 79 S. aureus strains used in this study, grouped according to the BURST analysis. a NA indicates that the strain may differ by at least three MLST genes from other strains recorded in the MLST database as of January 2008. Nucleotide sequences obtained during this study were aligned with those aur sequences which are available on the NCBI website ((see Availability and requirements section for URL), 6 January 2008) (strains 8325, Newman, COL, MRSA252, MSSA476, MW2, Mu3, Mu50, N315, USA300, RF122, JH1, and JH9). Sequence analysis of the aur gene confirmed that all investigated MRSA and MSSA strains possessed the aur gene of the same length of 1530 bp. Deletion or insertion events as well as truncation of the aureolysin protein by introduction of an early termination codon were not found. The phylogenetic relationships of the aur sequences are shown in Figure 1B. We found twenty four nucleotide alleles of the aur gene (Table 2) which translated to 15 amino acid sequences (Figure 2). Sequencing analysis supports our conclusion  that the aur gene occurs in two distinct groups (type I and type II) of related sequences. However, we found a greater diversity of alleles than reported previously . This was not unexpected due to a much more diverse strain collection. There were 195 (12.7%) polymorphic nucleotide sites, which resulted in 43 (8.4%) variable inferred amino acid positions. Type I consisted of 9 nucleotide alleles which translated to 6 amino acid sequences, and type II consisted of 15 nucleotide alleles which translated to 9 amino acid sequences. Pairwise differences in nucleotide sequences between representative pairs of alleles ranged from 1 to 40 (0.1–2.6%) nucleotide sites within type I, and from 1 to 13 (0.1–0.8%) nucleotide sites within type II, whereas between the types the differences ranged from 146 to 170 nucleotide sites (9.5–11.1%). The deduced amino acid diversity of preproaureolysin varied from 1 to 6 (0.2–1.2%) amino acid positions within type I, and from 1 to 4 (0.2–0.8%) amino acid positions within type II, whereas between types the difference was from 31 to 38 (6.1–7.5%) amino acid positions. Sequence comparison of metalloproteases from S. aureus. The deduced amino acid sequence represented by: strain 3498 is shared by alleles aur1 and aur2; strain HIP11983 is shared by alleles aur3 and aur5; strain 24 is characteristic for allele aur4; strain 1899 is characteristic for allele aur6; strain 3502 is characteristic for allele aur7; strain 481 is characteristic for allele aur8; strain 400 is shared by alleles aur9, aur10 and aur12; strain151 is shared by alleles aur11, aur13 and aur14; strain 272 is characteristic for allele aur15; strain 1678 is characteristic for allele aur16; strain103 is characteristic for allele aur17; strain 93 is shared by alleles aur18 and aur24; strain 125 is characteristic for allele aur19; strain C115 is shared by alleles aur20 and aur21; strain 1791 is shared by alleles aur22 and aur23. Black shading indicates identical amino acids. The arrowhead A indicates the predicted site of cleavage by signal peptidase; the arrowhead designated B shows the cleavage site of properly processed mature metalloprotease; and arrowhead C shows the cleavage site of the truncated mature form. The deduced amino acid sequences for strains V8-BC10  and NCTC 8325 http://www.ncbi.nlm.nih.gov/sutils/genom_table.cgi are identical to those for strains 93 and 3498, respectively. The figure was generated with Genedoc software (version 2.6.02) . Sequence parameters for 7 MLST housekeeping and aur genes. Data reporting numbers of alleles for all genes are summarized in Table 2. We found that the aur gene was much more polymorphic than the housekeeping genes. The nucleotide diversity value for the aur gene was 0.0554 and about five times greater than those for MLST housekeeping genes, ranging from 0.0074 to 0.0146 (mean = 0.0103). This implies that the aur gene was evolving at a higher rate than the MLST housekeeping genes (Table 2). However particular fragments of the aur gene showed different values of diversity. The most polymorphic was the profragment (0.0711) and the least polymorphic was the fragment encoding the mature protein (0.0459); by comparison, the prefragment showed a value (0.0556), which is almost identical to that of the whole gene. Most polymorphisms led to synonymous substitutions indicating a role of an environmental purifying selection in the evolution. The strength of purifying selection, expressed as the ds/dn ratio, showed a clear difference between the MLST housekeeping genes, between 6.34 and 10.50 (mean ds/dn = 7.50) and the aur gene, ds/dn = 17.56. Thus, there was a higher purifying selection in the aur gene; however particular regions of the gene showed different purifying strengths. The highest value was observed for the region encoding the mature enzyme, ds/dn = 27.05. The purifying selection for the region encoding the profragment was also higher, ds/dn = 14.88, than those for the MLST housekeeping genes and values were between those for the mature protein and the MLST genes. The (pre)fragment coding for the signal peptide had a value, ds/dn = 5.49, which was similar to those for the MLST genes. Homologous exchange of the aur gene between the supergroups leads to the presence of aur alleles of the same type in strains from both supergroups. In general, strains of supergroup I and II had aur of type I and type II, respectively. However, there were also some exceptions, which indicated the transfer of the aur gene. For aur of type I (alleles aur16 through aur24), the allele aur21 was found in a strain belonging to ST848 which in turn belonged to complex CC1. The allele aur22 was found in strains of ST157, ST241, and ST239 which were a part of CC8; the allele aur23 was found in the ST501 strain which was a member of CC8. Strains of clonal complexes CC1 and CC8 were representatives of the MLST supergroup II. For aur of type II (alleles aur1 through aur15), the alleles aur8, aur9, aur10, and aur15 were found in strains of ST123, ST151, ST182, and ST59, respectively, which were singletons and representatives of the MLST supergroup I. To examine the possibility of homologous exchange within a supergroup, we determined genetic variability of the aur gene within a sequence type and a clonal complex. We excluded from the analysis those strains for which we proved the aur transfer between the supergroups (strains of ST848, ST157, ST241, ST239, ST501, ST123, ST151, ST182, and ST59). Strains of the same ST usually possessed an identical aur allele with the exception of ST1 (aur6 and aur7) and ST5 (aur3 and aur4); however, their aur alleles differed by only a single nucleotide. With the exception of CC1 and CC101, strains of a given MLST clonal complex possessed their own aur alleles. In general, within a clonal complex, aur alleles were either identical (CC8, CC101, CC15, CC7, CC45) or showed little variation differing by a single nucleotide (CC1, aur6 and aur7; CC5, aur3 and aur4, and aur3 and aur5; CC22, aur16 and aur17) or by two nucleotides (CC5, aur4 and aur5). The aur alleles of different CCs differed by 14 to 38 nucleotides in supergroup I, and 4 to 13 nucleotides in supergroup II. Therefore, STs within a clonal complex should have identical aur alleles or alleles differing by up to two nucleotides whereas those aur alleles in strains of STs which are not related by MLST should differ between each other by at least 4 nucleotides. Using these rules, we detected a single event of homologous exchange within the supergroup I and numerous events of such transfer within the supergroup II. Exceptional cases of variation greater than two nucleotides of difference between the aur alleles within a clonal complex were found in CC1 (supergroup II) and CC30 (supergroup I). In these two clonal complexes almost all STs had an identical aur allele within a given clonal complex (CC1, aur6; and CC30, aur24). However, ST188 (CC1) and ST34 (CC30) which possessed the allele aur13 and aur19, respectively, differed substantially by 6 nucleotides from the allele aur6 and 16 nucleotides from the allele aur24. In supergroup II, several STs not related by MLST had an identical aur allele or closely related aur alleles (differing by a single nucleotide). Strains of ST842, ST843, ST9, ST20 and CC8 possessed the allele aur1. Strains of CC101, ST89 and almost all CC1 possessed the allele aur6 and strain 3502 (ST1) had aur7; ST151 and ST182 possessed alleles aur9 and aur10, respectively and ST188 and CC7 possessed alleles aur13 and aur14, respectively. Intragenic recombination events which result in a formation of linked runs of nucleotides within a sequence, whose ancestry is different from other nucleotides in the same sequence , are responsible for the mosaic structure of the sequence. In other words, a putative recombinant aur gene should consist of the DNA sequence stretches of both types of aureolysin. There was evidence of mosaicism within the aur alleles of type I for strains of ST22 (aur16), ST839 (aur17), and ST846 (aur18). Locations of breakpoints that represent end points of recombinant segments were found for alleles aur16 and aur17 pointing to recombination regions between nucleotides 279 and 324 and between 632 and 813, whereas for the allele aur18 data point to a region from nucleotides 306 to 324 (Figure 3). Schematic representation of the recombinant segments in the aur gene. The numbers under the gene are designated relative to the position of the first G in the GTG start codon of the aur gene and represent positions of recombination breakpoints. After excision of the recombinant segments (228 nucleotides in total) from all aur sequences, the resulting 1302 bp fragments were compared. Pairwise differences in nucleotide sequences between representative pairs of shortened alleles ranged from 1 to 16 (1 to 40 for the whole gene) nucleotide sites within type I, and from 1 to 12 (1–13 for whole gene) nucleotide sites within type II. Therefore, after removal of the recombinant sequences, the polymorphism was substantially lower within type I, whereas within type II it was almost the same. Very high congruence in topology was observed between phylogenetic trees based on the whole aur and shortened aur sequences (Figures 1B and 1C). This indicates that intragenic recombination had little effect on this gene. The only substantial differences were found for the branch lengths of recombinant aur alleles (aur16, aur17, and aur18). Purification to homogeneity by ammonium sulfate precipitation followed by ion exchange chromatography yielded 5 and 7 mg per liter culture for aureolysin of type I and type II, respectively. Enzyme titration with human α-2-macroglobulin showed 60% and 45% specific activity for types I and II, respectively, and this trend was observed in each preparation. N-terminal sequencing of the purified proteins revealed the AAATGT sequence for type I of the enzyme and an equimolar mixture of AAETGK and GKGVLG sequences for the type II (Figure 2). The latter sequences corresponded to putatively, properly processed and 6-amino acid truncated mature forms of aureolysin of type II, respectively. A set of low molecular weight synthetic substrates differing at the C-terminus was used to compare the substrate specificity of both types of aureolysin. Fa-Gly-Ala-NH2 and Fa-Gly-Val-NH2 were barely hydrolyzed by the enzymes. By contrast, Fa-Gly-Phe-NH2 and Fa-Gly-Leu-NH2 were more susceptible to hydrolysis. Hence, basic kinetic studies were performed. Both enzymes exhibited almost identical KM and kcat/KM values for Fa-Gly-Phe-NH2. Similar data were acquired for Fa-Gly-Leu-NH2; however aureolysin of type I showed a slightly higher substrate affinity (4.4*10-4 vs. 1.9*10-3 M for type II). It is also worth noticing that Fa-Gly-Phe-NH2 is a better substrate than Fa-Gly-Leu-NH2 for both types of enzymes. To confirm previous observations on substrate specificity, the synthetic substrate, galanin (29 amino acids), was used to test the substrate specificity of aureolysins. After 5 minutes incubation with the enzymes no differences in hydrolysis patterns were observed. Galanin, possessing the sequence: GWT|LNS|AG|Y|L|LGPHAIDNHRS|FHDKYG|LA-NH2, was digested (in places marked by |) at the N-terminal side of leucine, alanine, tyrosine and phenylalanine residues but not glycine, indicating that both types of aureolysin preferentially cleave peptide bonds before large hydrophobic amino acids. Additionally, selected proteins were incubated with both types of aureolysin and subjected to electrophoresis. In our hands no differences in the digestion patterns of β-casein, human low and high molecular weight kininogen, and human blood serpins, α-1-antitrypsin and α-1-antichymotrypsin, were observed. Moreover, aureolysin of type I alike type II had no proteolytic activity against elastin and type I collagen. The value obtained for nucleotide diversity of aur (0.0554) revealed a high degree of gene polymorphism and was comparable to values obtained by Kuhn et al. for core adhesion genes (mean = 0.077 ± 0.046) as well as accessory adhesion genes (mean = 0.088 ± 0.063). However, in contrast to findings by Kuhn et al. that housekeeping and adhesion genes showed similar levels of purifying selection, our data revealed that the aur gene was subject to stronger purifying selection than the MLST genes. Furthermore, the least diversity and highest purifying selection of the gene fragment encoding the mature enzyme in comparison to the sequences coding for pre- and pro-fragment strongly suggest that proper enzymatic activity and specificity of aureolysin is very important in the processing of other staphylococcal proteins. Moreover, Beaufort and colleagues  recently reported that aureolysin can also be a highly specialized virulence factor. By precise proteolytic cleavage aureolysin activates the human fibrinolytic system, enabling S. aureus spread and invasion. Although S. aureus is predominantly clonal, events of homologous exchange can occur and may play an important role in the evolution of S. aureus clones. Our results provide evidence for genetic exchange of the aur locus between unrelated strains of both supergroups and different clonal complexes. Kuhn and colleagues  previously showed high congruence between the gene trees constructed from concatenated sequences of MLST housekeeping, core adhesion (clfA, clfB, fnbA, map, sdrC, and spa), and accessory adhesion genes (ebpS, fnbB, sdrD, and sdrE), indicating that recombination had little effect on the population structure. However, when they investigated each gene separately, some evidence for homologous exchange was found. The best congruence between trees was observed with clfA and the least was observed with clfB. The aur locus is located close to the clfB locus (7 kb apart in all sequenced genomes). S. aureus is predominantly a clonal species, but some of its genomic regions show higher recombination rates and, based on the previous report of Kuhn and co-workers , we can infer that the aur locus is located in such a region, since it is located in the close vicinity of the clfB locus. The restriction-modification (R-M) systems serve in phage defense as well as the stringent control in foreign DNA acquisition. Therefore, R-M systems are modulators of the frequency of genetic variation. Waldron and Lindsay  proposed that the Sau1 type I R-M system is the major mechanism for blocking gene transfer into S. aureus isolates from other species, as well as between isolates of different S. aureus lineages. Moreover, Sung and Lindsay  concluded that there are certain S. aureus lineages and strains possessing deficiencies in the dominant R-M what in turn leads to a hyperrecipient phenotype. They found naturally occurring hyperrecipient strains and the best example of this phenomenon was the bovine lineage ST151. Our analysis demonstrated that among the strains for which we found homologous transfer of the aur gene was also a strain of ST151. We can only hypothesize now that the same genetic mechanisms could play a role in exchange of the aur locus between the strains of other lineages. Our analysis of the aur gene is esentially descriptive; however, the impact of the findings should be beneficial in designing future molecular tests. In our laboratory, based on knowledge about polymorphism of the aur gene, two rapid approaches are under construction for determination of the dominant S. aureus lineages and for species identification of the genus Staphylococcus. Currently, routine determination of S. aureus lineages is conducted by sequence-based typing methods (spa typing and MLST) or/and PFGE (Pulsed Field Gel Electrophoresis) which are time consuming and expensive. A new typing method will be based on restriction profile analysis of the aur gene by digestion with a restriction enzyme. However, there is confusion about the discriminatory power of a single marker (some unrelated lineages of supergroup II possess the same aur allele), therefore, another gene located in the genome at least 1 Mb from the aur gene (to eliminate a possibility that both genes took place in the same homologous exchange) will be chosen and investigated in detail. A new duplex PCR-RFLP (Restriction Fragment Length Polymorphism) method will be a substantial support for currently used typing methods in epidemiological studies. Another molecular approach developing in our laboratory is single-tube multiplex-PCR for the simultaneous detection and discrimination of Staphylococcus species. For this purpose, genes encoding metalloproteinases from the thermolysin family are investigated. These genes are conserved among strains of given species and are unique compared to other species of the genus Staphylococcus. Primer pairs will be designed to yield single species-specific in size amplification products. Therefore, to design an efficient diagnostic test for Stahylococcus species identification, a very detailed knowledge about polymorphisms of the aur and aur-like genes is needed. In this paper we provide evidence that homologous recombination contributed to the evolution of the aur gene. Our study distinguishes between homologous exchanges of the entire aur gene (assortative recombination) between divergent lineages of S. aureus and recombination events within the aur gene. Despite the aur gene being highly polymorphic, purifying selection leads to limited variation of aureolysin at the amino acid level. Accordingly, purifying selection may provide only for small phenotypic differences and should not be a mechanism for isolating bacterial populations. Indeed, although we were able to detect minor differences in affinity of the proteases to low molecular weight synthetic substrates, no detectable dissimilarities in protein digestion pattern were observed. Mature forms of aureolysins whose biochemical properties were compared differed in 9 amino acid residues. Such a high degree of sequence similarity may mean overall structure identity, which in turn reflects no differences in protein digestion efficiency. However, keeping in mind the observed minor differences in the enzymatic properties against low molecular weight substrates, we cannot exclude a role for aureolysin in interactions with yet undefined proteins where two variants of this protease may act differently. These studies were supported in part by a grant 2 P04A 001 27 (to AS, BW, AD and WH) from the Committee of Scientific Research (KBN, Poland) and the European Social Fund and national budget in the framework of The Integrated Regional Operational Programme (to BW). The authors are grateful to Dr. Andrzej Kozik, Faculty of Biochemistry, Biophysics and Biotechnology, Jagiellonian University, Krakow, Poland and Dr. Piotr Rekowski, Faculty of Chemistry, University of Gdansk, Poland for sharing LMWK, HMWK and galain, respectively. AJS partcipated in the study design, designed the primers, completed many of the amplifications, prepared part of the amplicons for sequencing, edited sequences, performed the alignments and phylogenetic analyses and wrote the manuscript. BW participated in the study design, biochemical analysis, wrote portions of the methods, results and discussion. KKS performed many of the amplifications, prepared the amplicons for sequencing. HG provided S. aureus strains and conducted critical assistance in drafting the manuscript. JMvD contributed to the revision of the manuscript. JK performed biochemical studies. PCA provided S. aureus strains and drafted the manuscript AD contributed in results analysis and was involved in drafting of the manuscript. WH provided S. aureus strains, participated in design and coordination of the project, and helped in drafting the manuscript. All authors read and approved the final manuscript.